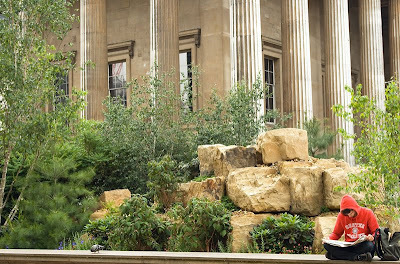 Kew gardens has built an Indian landscape in front of the British Museum. A perfect place to sit in the sun and catch up on a bit of reading. plus listening to the dove cooing. Nice one, Mo. It does seem like a pleasant place to relax after exploring the museum. So peaceful looking. Love all the browns and greens. I love city gardens ! I wish I were that boy/young man reading there! A hoody? It's terribly hot here these days! So ... even more, I wish I were there! This sounds great. I'd love to see it! Cool! I want to go back to Kew Gardens and walk the Tree Walkway! They were still constructing it the last time I was there. So it looks. I liked Kew Gardens a lot. Very tranquil, at least in the off-season when I was there. I used to love sitting there and relaxing. It's been a while. Reading your blog is like going back in time for me... I love it. In Kew garden I learned what a haha is.